A call to Joost Goverts at Northrop & Johnson in Spain brings news of price cuts on the sailing yachts Aglaia and Blue Titan. Aglaia is a 23.47m GRP yacht. Built by Hamble Yacht Services in 2002 to a design by Rob Humphreys and ABS classed, she was refitted in 2004. This superyacht's interior by Ken Freivokh accommodates six guests in a master, double and twin cabin and she cruises at 9 knots. 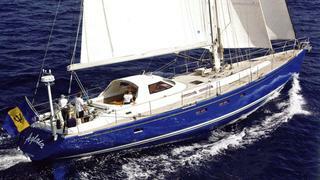 Aglaia is now down from €1,795,000 to €1.5 million. Blue Titan is a 26.8m sailing yacht built by Taiwan’s US Yacht Building Corporation in 1988 to ABS commercial standards. Designed by Ted Hood, she's MCA compliant and accommodates up to eight guests in three staterooms and was refitted in 2008. Blue Titan is an immensely powerful superyacht with world cruising capabilities, including a strengthened ice breaker bow. A draft of just two metres allows her to enter the shallowest passages and anchor in the quietest harbours and she can easily be sailed by a crew of only two. Formerly listed at €850,000, Blue Titan is now asking €775,000.